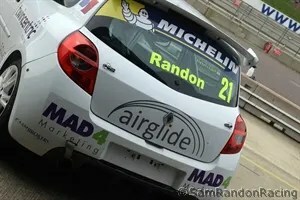 SAM Randon showed good pace for his new team in the Michelin Clio Cup Series at Snetterton. The Ashbourne teenager battled well against the top drivers but had to settle for ninth place in the opening race and failed to finish the second after contact with other cars. “I was determined to deliver a result for headline sponsors Greenbank Group and all the sponsors and supporters who helped get me back on track,” said the 19-year-old JCB apprentice. Damage incurred during the last round at Brands Hatch all but wiped out his remaining funding for the year. But with additional support from sponsors, plus a swap to Derby-based 20Ten Racing, he was soon up to speed during testing at the Norfolk track. Qualifying proved more problematic and he found himself in the middle of the grid for the first race but he made up several places from his 11th-place starting slot. He said: “My car felt good at the start of the race and I stayed with the leaders’ pace and even gained a little as they fought each other. The 20-minute second race was over in 20 seconds for Randon. As the lights went out and the cars accelerated from the start, he became embroiled in a four-car battle. Contact was inevitable, two of the cars spun out and a rear tyre on Randon’s machine was punctured. the four of us started a series of events that, this time, resulted in me coming off worst,” he said. 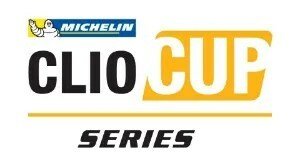 The climax to series will be in three weeks’ time at Croft. 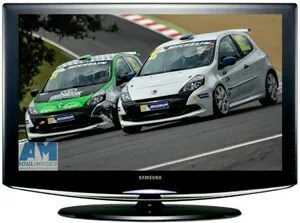 The first race of the Snetterton weekend – August 30/31 – will be televised live on Motors TV (Sky channel 447) at 15:25. 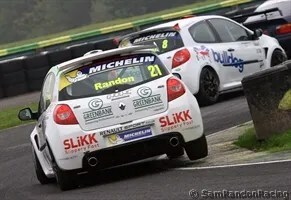 Despite gloomy prospects following a disastrous Brands Hatch weekend, Sam Randon plans to be back in the driving seat for rounds 9 and 10 of the Michelin Clio Cup Series next weekend. After frantic activity to find the funding the young racer had to make some difficult decisions. 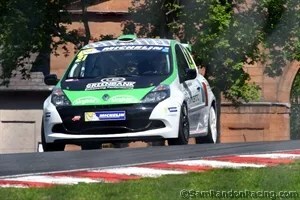 Despite the problems at Brands Hatch, Sam is currently running 5th in the championship. The first race of the Snetterton weekend will be televised live on Motors TV (Sky channel 447) at 15:25. 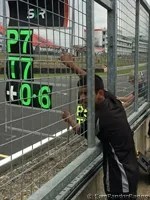 ‘ Character building’ was an overused phrase this weekend for teenage race driver Sam Randon as a succession of incidents and bad luck not only hampered his weekend, but have potentially brought the youngsters season to a premature end. 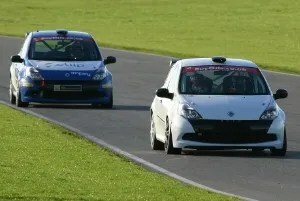 The historic Kent circuit of Brands Hatch was the host for rounds 7 and 8 of the Michelin Clio Cup Series on the short Indy configuration, but Randon’s run of bad luck started before he even reached the circuit on the Friday test day. Randon has suffered all season due to a lack of funding for testing, so to lose the test day due to mechanical gremlins was frustrating. Even that optimism was short lived though as a very tight qualifying session left Sam disappointed languishing back in 9th place. Father Neil explained “Brands Indy is a short lap, and the times were very close throughout qualifying. Sam was only a couple of tenths of a second behind the front row, but it was enough to drop him into the mid pack – a dangerous place to be and so it proved”. A poor start to Saturday’s race didn’t help matters and in a busy mid pack Sam’s steering was damaged in a first corner clash which then impacted his race pace. A P8 finish was only achieved with some heroic defending which resulted in yet more damage to the car. With a cleaner start to round 8 the Ashbourne youngster was running in the busy pack through the first lap until he was squeezed to the outside of the track at Clearways corner and dropped a wheel into the gravel. By the time he had recovered he was dead last and chasing hard. Clocking up lap times that matched the leaders, Sam quickly caught the back of the pack. Taking a cautious approach and backing out of a pass through Druids corner he made a clean and decisive pass at Clearways, or so he thought. “But unfortunately the damage bill for the car this weekend will likely consume the rest of our 2014 budget so this could be the end of the road for this year with 4 more races still to go”. Determined to bounce back, Sam will now focus his attention on seeking additional funding for the 2015 season and working on his off-track obligations with current sponsors. 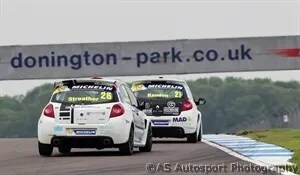 Ashbourne racer Sam Randon proved he could run with the best at a sun soaked Donington Park this weekend as he finished a creditable sixth position in what was the half-way point of his championship season in the Michelin Clio Cup Series. 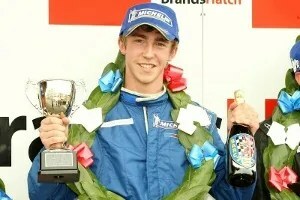 Against some very experienced and capable drivers, including one ex-British Touring Car driver, the 19 year old JCB apprentice overcame a serious disadvantage of having never driven the 1.96 mile circuit in the dry before his qualifying session on Saturday. 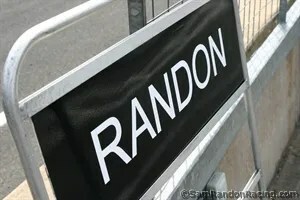 With a growing portfolio of local sponsors, the Randon team found themselves developing more new skills in the entertainment of sponsor guests and supporters with a full hospitality tent on both race days. 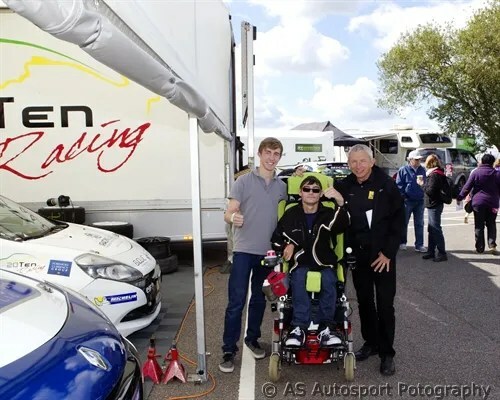 Sam’s father Neil added “This is an important part of the sport and we are learning as we go, but the awning had a real buzz about it this weekend and we’ve had some great feedback. 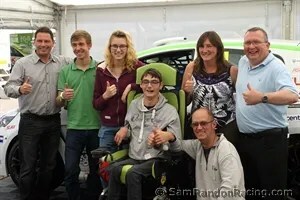 It is a balancing act as we have to allow Sam to concentrate and prepare for his races, but he was also able to spend time explaining his craft to the guests and showing them around his car. We were lucky with the weather but it seems to have been a huge success”. 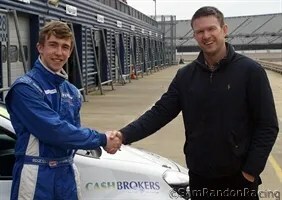 Swadlincote based Greenbank Group are the latest company to financially back the young driver. 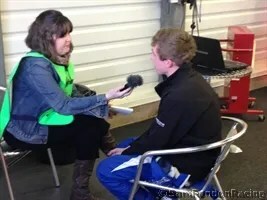 Determined to make amends for a poor result at Oulton Park, Sam bounced back during a wet testing day at Donington Park by topping the timing screens in the difficult conditions. 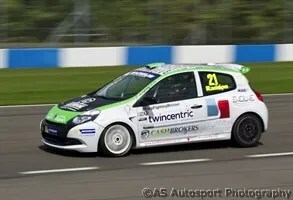 Sam hopes to bag some serious points at the Donington weekend to get his season championship back on the rails. “I be happy if it rained now for the race weekend” said the 19 year old. 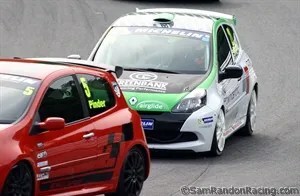 Greenbank Group-backed Sam Randon had a troubled start to the first Clio Cup Series encounter at Oulton Park and finished a disappointing 12th. However, after a thorough debrief with SV Racing Director, Danny Buxton, Randon returned to the scenic circuit keen to make amends in Round 4. 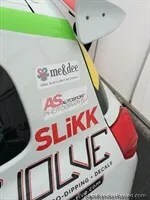 Randon, from Ashbourne, added: “I was there or thereabouts in free practice on Friday morning, but I struggled later in the day as I didn’t feel 100 per cent. This put me on the backfoot for the rest of the weekend, slowing my progression. There aren’t many overtaking places, so qualifying is critical to make the most of the races and the loss of just a couple of tenths put me way down the order. 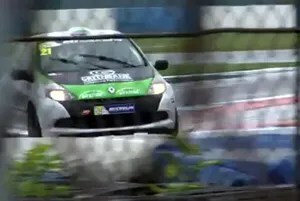 Oulton Park is a confidence track and you just need the balls to take it on, so I was capable of fighting at the front. 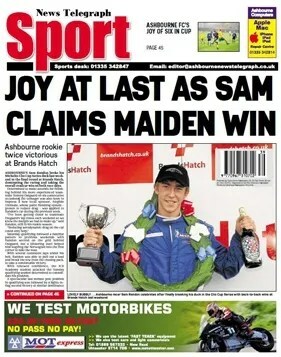 Oulton was a character building weekend for Sam, who is now looking forward to rounds 5 and 6 at Donington Park. 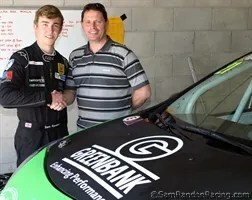 The graphics on the car take a dramatic change as The Greenbank Group joins SamRandonRacing as a headline sponsor for the remainder of the 2014 season. The Greenbank Group, which designs and manufactures specialist products for the power generation and mining industries, is the latest firm to recognise Sam’s potential. 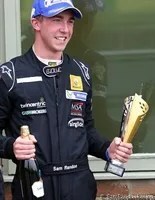 Charles Conroy, the company’s Managing Director, explained: “We’ve been impressed by Sam’s performances at this level and his dedication to a sport that combines engineering excellence with individual talent.  As part of the deal, the Greenbank logo will become a prominent feature of Sam’s Team SVR race car, run by ex-Touring car driver Danny Buxton, which is capable of 142mph from its 2.0 litre Clio engine. An engineering apprentice at JCB, Ashbourne-based Sam says sponsorship from well-respected firms such as Greenbank is an essential ingredient for success in motorsport. 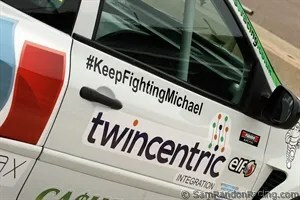 “I’m delighted at this latest offer of support, and as well as raising the company’s profile we will be providing the company, its staff and customers with unique access to the world of competitive motorsport,” he added. 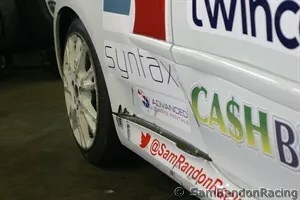 You may have seen the logo on the race car, so SamRandonRacing is pleased to finally announce a new partnership with Derby based Syntax Consultancy. Syntax has 27 years experience providing IT and Technical Engineering talent solutions to the NHS, Education, Technology Consultancy, Rail and Advanced Engineering markets. Their services include Permanent solutions, Contract and temporary solutions, Senior and Executive Search, Graduate Campaigns and Talent Management Solutions. Interest in Sam’s potential as an ambassador for Syntax plus our network of business contacts has brought us together to ensure value to both parties. We look forward to a long and fruitful partnership together. Season starts with a podium first time out! 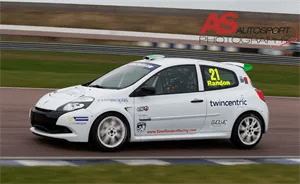 ASHBOURNE’S Sam Randon landed a podium finish on his debut in the 2014 Michelin Clio Cup series at Rockingham Motor Speedway. 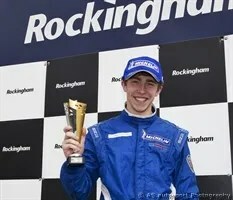 He stands third overall after the first weekend, having been involved in a spin and finishing ninth in the second race. Only 11th in qualifying for the first race, Randon shot to fifth on the opening lap as he avoided a coming-together involving several cars in front of him. After a brief safety car intervention, he continued to make progress and finish an impressive 3rd on his race car debut. He was less lucky second time out, having caught the leading bunch napping, he made up 6 places in 2 corners but a tag from behind sent him into a spin and tumbling down the order. He clawed his way back to ninth with a damaged rear end. 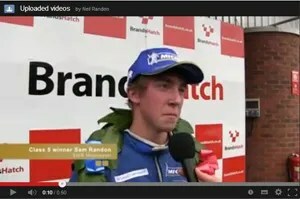 Randon said: “I had an incredible start to Round One, which we had preplanned. 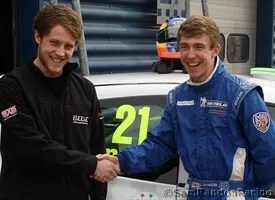 It worked a treat and was just as effective in race two, when a small tap from behind at the Deene Hairpin spun me out. “Despite that, I have to be happy with my points total. 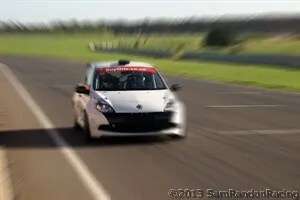 Watch the Clio Cup Series official video of the day here with good coverage of Sam in both races including his spectacular spin. 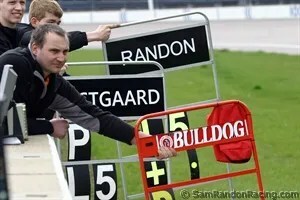 A well know face around the paddock, Alan Smeaton, joins forces with SamRandonRacing to provide us with high quality photography for the season. Alan is both a photographer and a motorsport fanatic and considers himself very lucky to have the opportunity to combine both of his passions to bring us the very best in motorsport photography. Alan is based in Norfolk but can be found lurking with his camera at most circuits in the UK during the season. 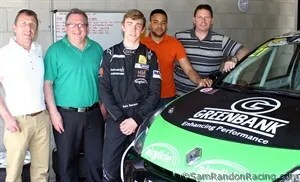 Derby race driver Sam Randon launched his 2014 season at Rockingham Motor Speedway near Corby this week with success both on and off the track during the official Renaultsport press day designed to launch the burgeoning series. 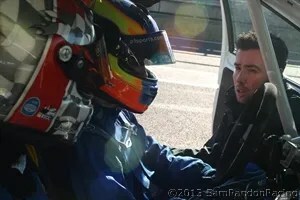 The day provided much needed track time for the youngster, limited by budget as he tries to make his way in the high profile race car class, but the event crucially provided the opportunity to invite guests and potential sponsors to see the car in action and experience the SamRandonRacing hospitality experience. “In between the official Renaultsport interviews and press responsibilities, we had a dozen or so guests to entertain and show what we can offer during a typical race weekend”. “Then suddenly I have to put my helmet on and focus on my driving again. It was hard work but great fun”. On track, the Ashbourne driver continued to impress, posting competitive lap times on his worn tyres until, for the first time in this car, the team put on new rubber to simulate a qualifying session. 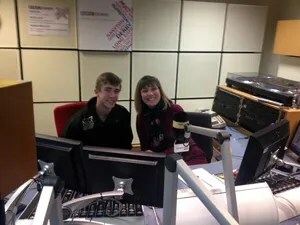 Funding has been a constant challenge at this level for the young charger, but following a marketing offensive in recent weeks including appearances on BBC Radio Derby and Radio Ashbourne, the much needed sponsorship support has started to grow. 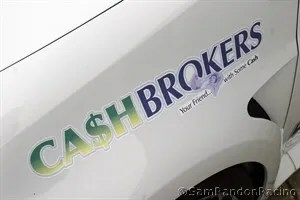 Joining existing sponsors Airglide and Twincentric Integration, Nottingham based pawnbroker franchise Ca$hbrokers have recently agreed to support Sam, along with Derby based automotive customisation specialists Evolve Automotive. We are really pleased to announce a new for 2014 sponsor, Nottingham based Ca$hBrokers offering Pawnbroking for the 21st Century. 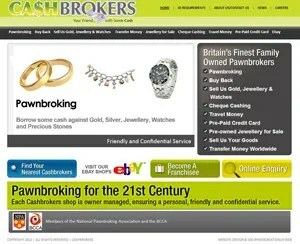 Ca$hBrokers are a family owned company offering services such as pawnbroking, buying and selling gold, jewellery and watches and more. Look out for their livery on Sam’s car soon. Based centrally in Derby, Evolve Automotive offer their clients the very best in automotive customisation including; hydro dipping, vehicle wrapping, window tinting, engine remapping, custom coatings, plasti-dipping, gold plating and dent removal – protecting and enhancing the antithetical value and performance of your vehicle. Evolve will be providing our stickers and graphics this year. Check out the Friday 07/3/14 podcast from the Sally Pepper morning show on BBC Radio Derby. Sally interviews Sam and father Neil about his ambition to succeed in a sport despite constant budget challenges. “I was a bit nervous at first” said Sam “but Sally soon put me at ease and her easy style made the conversation flow“. Listen out also on Ashbourne Radio this week for another short interview with Mark Atherton. 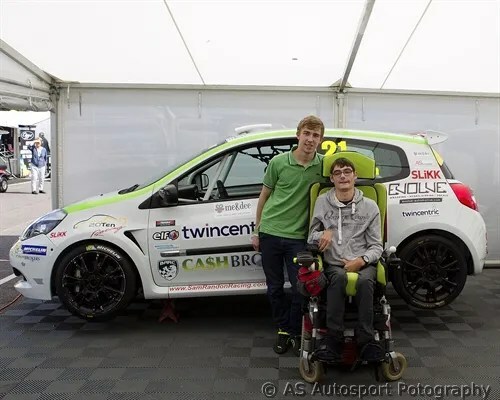 The exposure gives Sam the opportunity to reach a wider audience in his quest to fund this year in the Michelin Clio Cup Series. 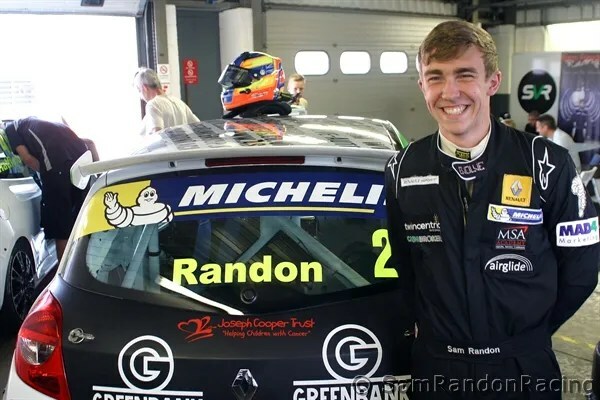 Sam Randon has joined the leading SV Racing team as he prepares to step up to the ‘Racecar’ division of the Michelin Clio Cup Series with Protyre in 2014. 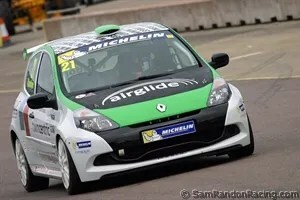 The 18-year old from the Derby was highly impressive during his maiden season of car racing in the burgeoning Michelin-backed Clio Cup Series. 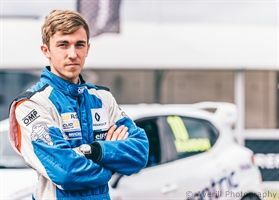 A leading light in the series’ ‘Roadcar’ division for road-going Clio Renaultsport 197s throughout last year, he achieved numerous class podiums before capping off a sensational season with a race win at Brands Hatch in September. Randon went on to show a great turn of speed during his maiden test in a race-spec Clio Cup car with SVR in October, completing approximately 120 laps of the 2.99mile Snetterton ‘300’ circuit near Thetford, Norfolk with guidance from SVR Director, Danny Buxton, and Dunlop MSA British Touring Car Championship (BTCC) podium finisher, Jack Goff. 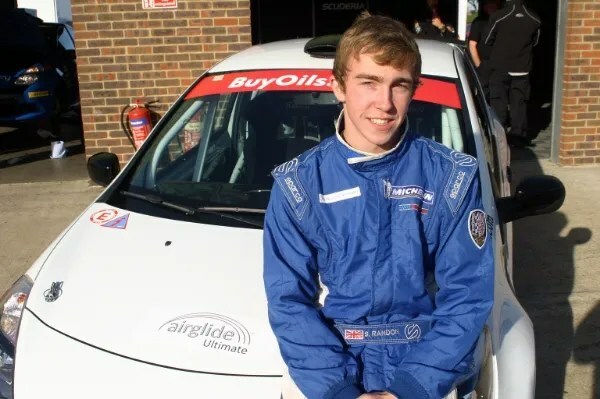 The young charger far exceeded all expectations on his first outing in Clio Cup machinery and this raw speed, consistency and maturity proved to be a catalyst for a full 2014 Michelin Clio Cup Series campaign in SVR colours, during which he hopes to mount a consistent challenge for victory. Randon – an Apprentice for JCB – brings with him lucrative backing from Twincentric Integration and Airglide International Ltd.
Twincentric Integration – a long-established IT software and services company – sponsored Randon’s early Karting career and, having found the lure of the Michelin Clio Cup Series too much to resist, will rekindle its partnership with the young Ashbourne-based hotshot in 2014. 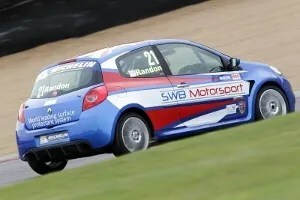 Ashbourne’s Sam Randon impressed during his maiden test in a Renault UK Clio Cup car with the leading Scuderia Vittoria race team at Snetterton on Wednesday. 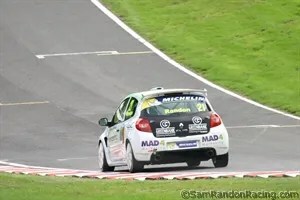 ASHBOURNE’S Sam Randon broke his Michelin Clio Cup Series duck last weekend in the final round at Brands Hatch, dominating the racing and taking the overall roadcar win on both race days. Determined to consolidate his maiden win over his more experienced teammate Tommy Ostgaard the previous day, the teenager was also keen to impress a new local sponsor, Airglide Ultimate, whose paint finishing system – proven to reduce drag – was applied to Randon’s car during the previous week. “I’ve been getting closer to teammate Ostgaard’s lap times each weekend so we knew the margin we had to make up,” said Randon, still in his rookie season. The 18 year old JCB Apprentice attacked the Sunday qualifying session determined to consolidate his position. A spectacular last minute pole position in qualifying was followed by a lights-to flag second victory of similar dominance to the previous day. Randon now intends to build on his success this year and plan a 2014 campaign in the faster and more prestigious racecar class. At last – race winner! After following teammate Tommy Ostgaard home for the last 6 races, 17 year old Sam’s determination finally paid off today with a first overall roadclass win at Brands Hatch in Kent. After qualifying P2 yet again, Sam took the lead by the first corner after Ostgaard was baulked by a slow starting Cup car, but the lead was short-lived when a charging Jake Honour dived inside at Druids. A jubilant Sam explained “I was planning to work on my lead as Tommy had a terrible start but I wasn’t expecting Jake to nick the place. 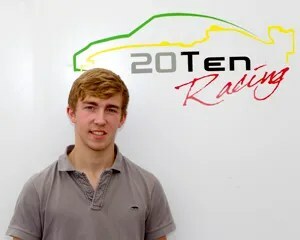 I had to settle into a rythm behind Jake and got the lead back a couple of laps later at Paddock Hill“. From that point the charging Randon built up a lead through concentration and consistency, taking the chequered flag for the roadcar class by some 5 seconds ahead of the chasing pack and fastest lap into the bargain. Click here for post race interview.